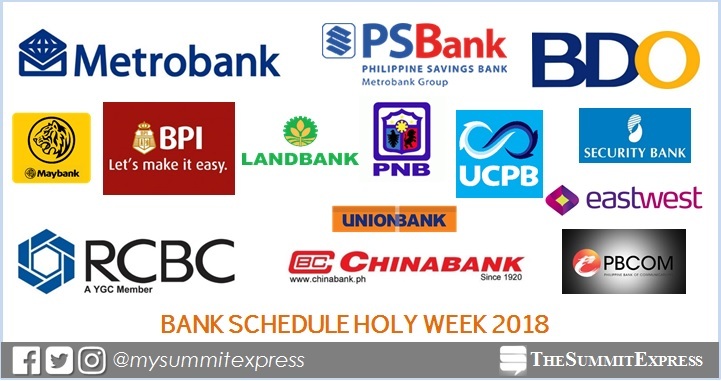 MANILA, Philippines - Most of the banks are closed on Thursday and Friday, March 29 and 30 for the observance of Lenten Season or Holy Week this 2018. View on this page for the comprehensive list of bank schedules. 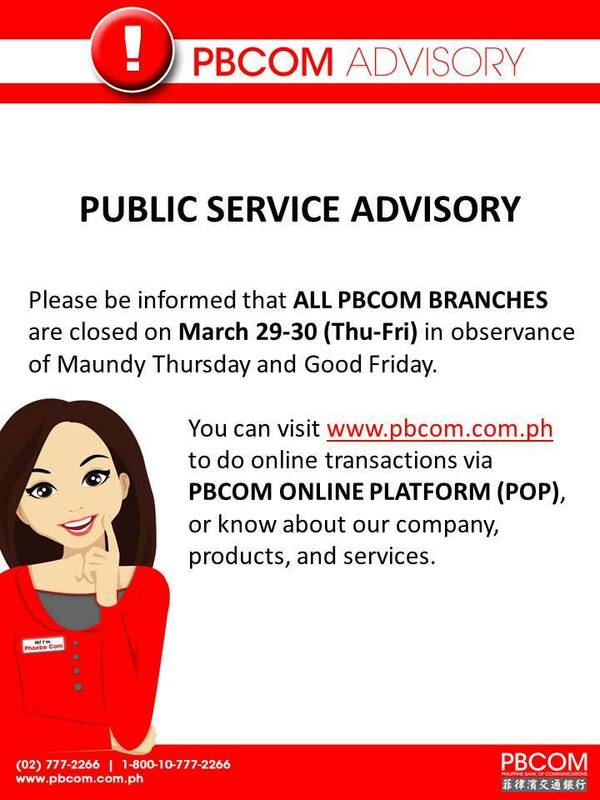 Branches of BDO Unibank will be closed from March 29 (Maundy Thursday) to April 1 (Easter Sunday). Electronic banking channels and services, such as ATMs, Debit Point-of-sale (POS), phone banking, mobile banking, personal and business online banking are ready to accept and process transactions except from 2 a.m. to 7 a.m. on Good Friday due to a regular network maintenance activity. Meanwhile, ATMs onsite (located at the branch ) will be unavailable only from 6am to 7am on March 30. 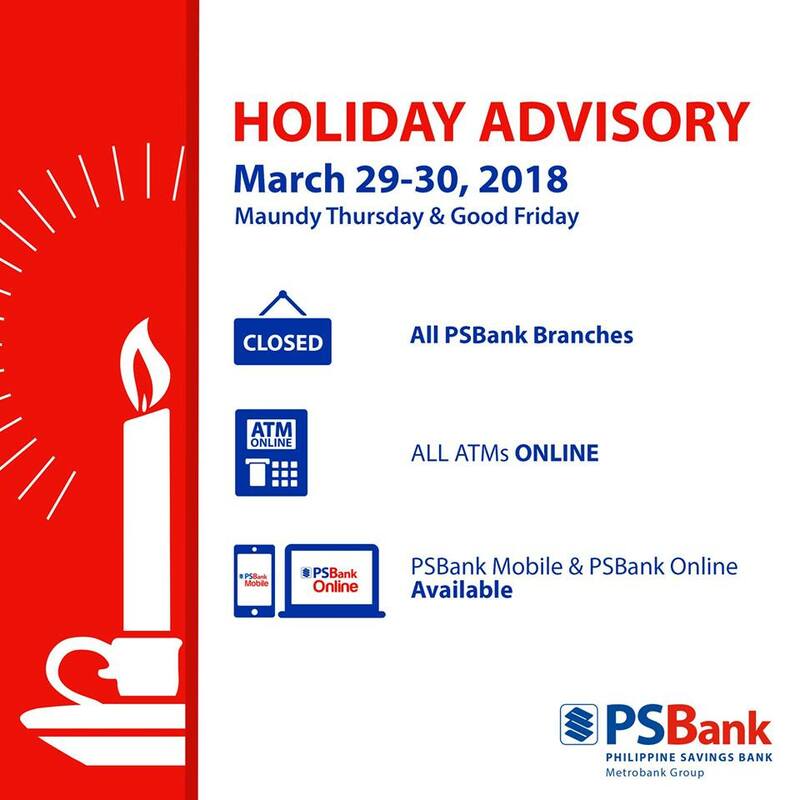 All BPI, BPI Family Savings Bank and BPI Direct BanKo branches and kiosks nationwide will be closed from March 29, Maundy Thursday to April 1, Easter Sunday. Regular bank operations will resume on April 2, Monday. Online payments made from March 29 to April 1, will be posted on April 3, Tuesday. For urgent concerns, you may reach BPI’s 24/7 contact center at 89-100. Metrobank said that selected branches will be open to serve this Holy Week on March 29 (Maundy Thursday), March 31 (Black Saturday) and April 1 (Easter Sunday). Here's list of branches to open during the break. Select Security Bank branches will be closed from March 29 to 31. Only NAIA and NAIA Terminal 3 branches will be open on Black Saturday and Easter Sunday (March 31 and April 1, 2018) from 11:00 am to 7:00 pm. During these days, Security Bank Online and all Security Bank ATMs will be available for your banking needs. Regular operations of all branches will resume on Monday, April 2, 2018. View the location of Security Bank ATMs here. Philippine Savings Bank (PSBank) said all its branches nationwide will be closed on Thursday and Friday, March 29 to 30. All Maybank branches will be CLOSED from March 29 to April 1 (Thursday to Sunday). Regular bank operations will resume on Monday, April 2. 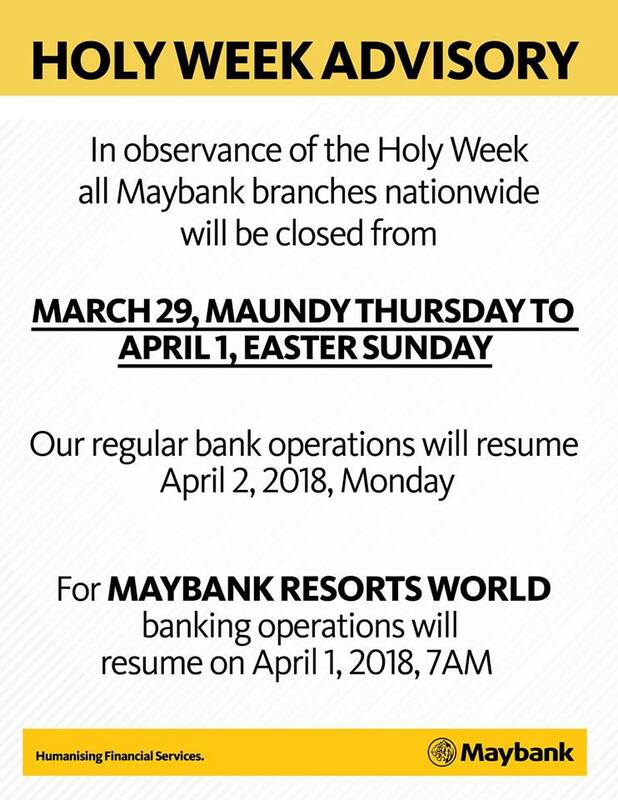 For Maybank Resorts World, banking operations will resume on April 1 at 7 a.m.
All branches will be closed on March 29 (Maundy Thursday) and March 30 (Good Friday). All bank branches will be closed on March 29 and 30. Clients may still transact through their ATMs and online banking facilities. 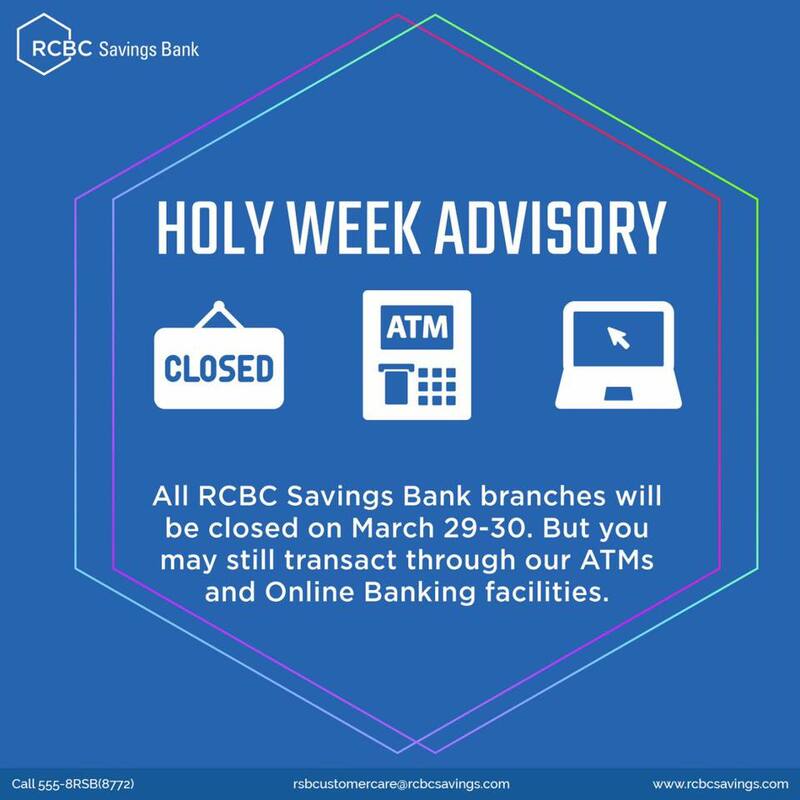 The following domestic branches, overseas offices, and subsidiaries are OPEN to serve you this Holy Week. All EastWest Bank Stores (branches) will be closed on March 29 (Holy Thursday) & March 30 (Good Friday). Listed below are select EastWest Stores that will be operational on Black Saturday (March 31) and Easter Sunday (April 1). All Chinabank branches will be closed from March 29 to April 1. Regular banking schedule will resume on Monday, April 2. Please be reminded also of the scheduled system upgrade starting 2pm of Maundy Thursday, March 29 until 2pm of Holy Saturday, March 31, 2018. During this time, ALL China Bank online services (Internet Banking, Phone Banking and Mobile Banking) and ATMs will be unavailable. ALL UnionBank branches will be closed from March 29 (Thursday) to April 1 (Sunday).